Go! Go! Curry!’s most famous dish: the Major Curry. Toppings Galore! On our second day in Sendai, M and I were walking down a shopping arcade near the station when we stumbled upon a sign that stopped me dead in my tracks. Bright yellow with an angry looking gorilla on it, I would be able to recognize that logo anywhere: Go! Go! Curry! Go! Go! Curry! 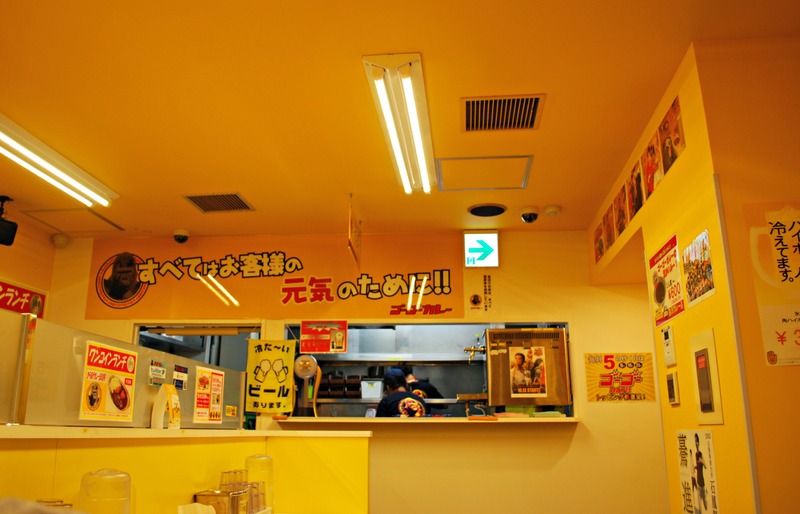 is an immensely popular curry restaurant chain in Japan that features large servings at very reasonable prices. The store’s name is derived from Hideki Matsui’s number (55) when he was playing with the Yomiuri Giants baseball team (in Japanese, 5 = Go, so 55 = Go Go). The chain has gotten so popular that it has expanded beyond Japan and opened up stores in Indonesia, Hong Kong, Brazil, and the United States (4 stores in NYC —- unfortunately very far from where I live in Southern California!). Even though we’d just had curry the night before at a tongue restaurant, we weren’t about to turn down the chance to eat at our favorite curry chain. So we trooped down the steps to the basement level where Go! Go! Curry! was located. 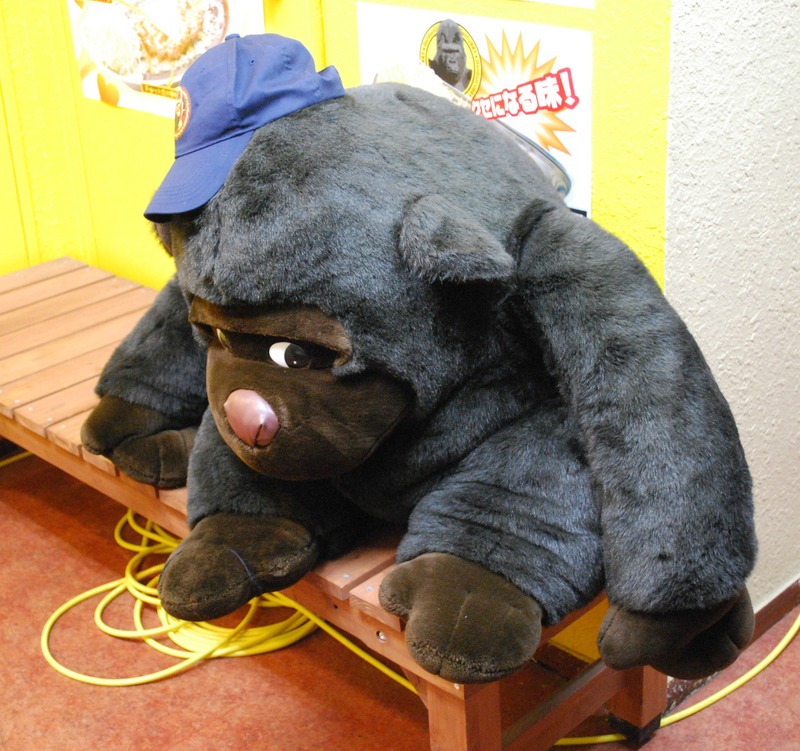 Right outside the door, sitting on a bench, was a stuffed version of the chain’s mascot, Gorry, waiting to greet customers. 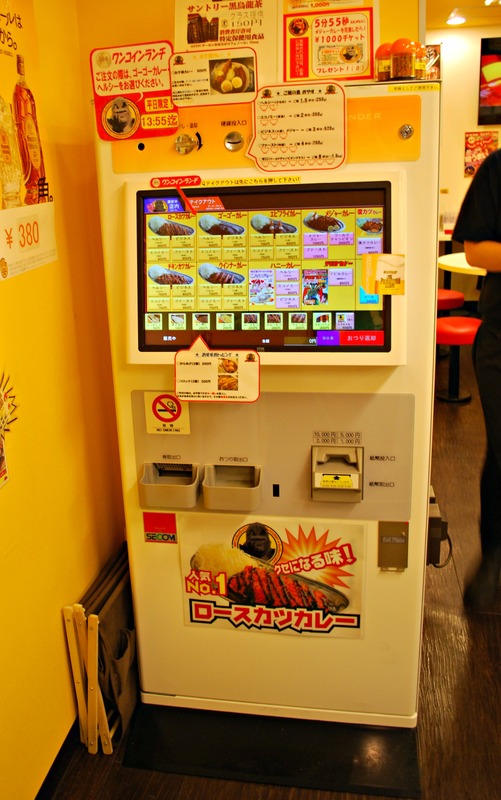 Similar to many other inexpensive chain restaurants in Japan, Go! Go! Curry! 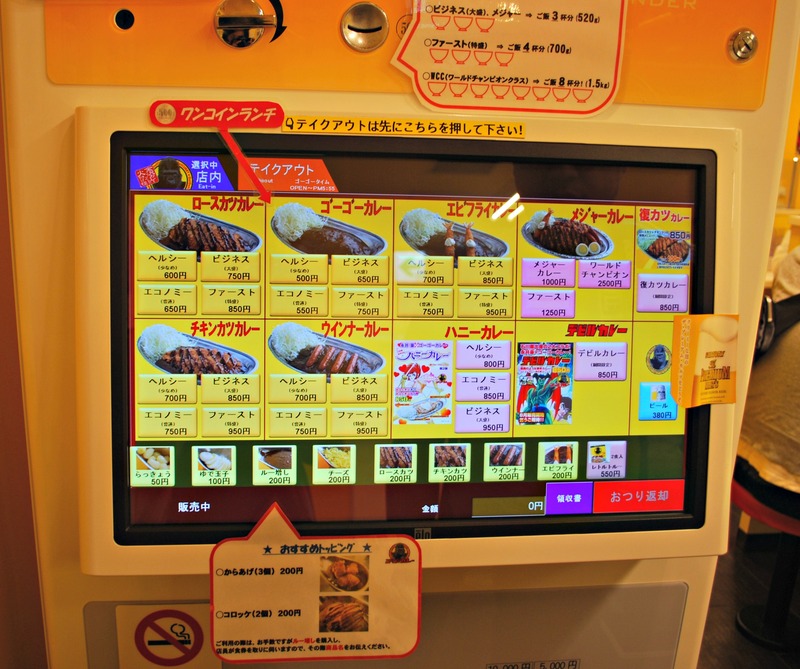 has a ticket vending machine through which customers order and pay for their food. On the wall next to the machine were a number of posters advertising some of their more popular dishes. But I already knew which one I wanted —- the famous Major Curry! I had seen other people eating it before but I’d never attempted to try it myself. 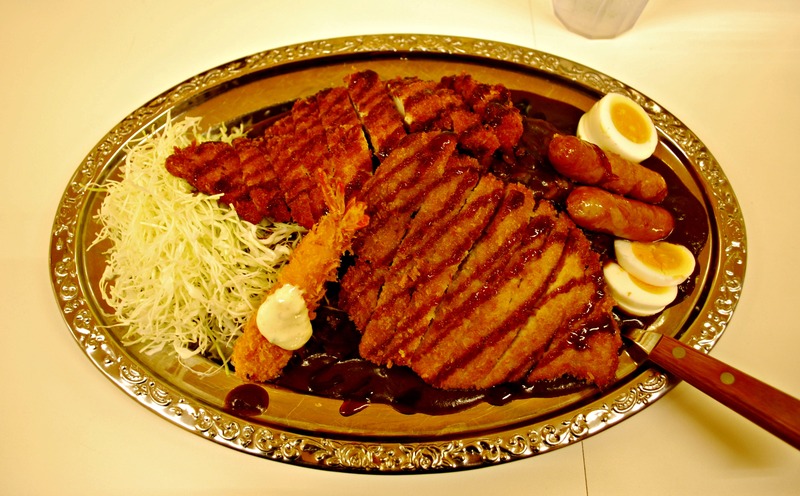 This dish comes loaded with every topping the store has to offer: chicken katsu, pork katsu, boiled eggs, sausages, and fried shrimp. Better yet, the store was having a special that day and the price had been slashed from 1500 Yen to 1000 Yen. What a deal! M wasn’t feeling quite as hungry as I was so he opted for a simple pork katsu curry. 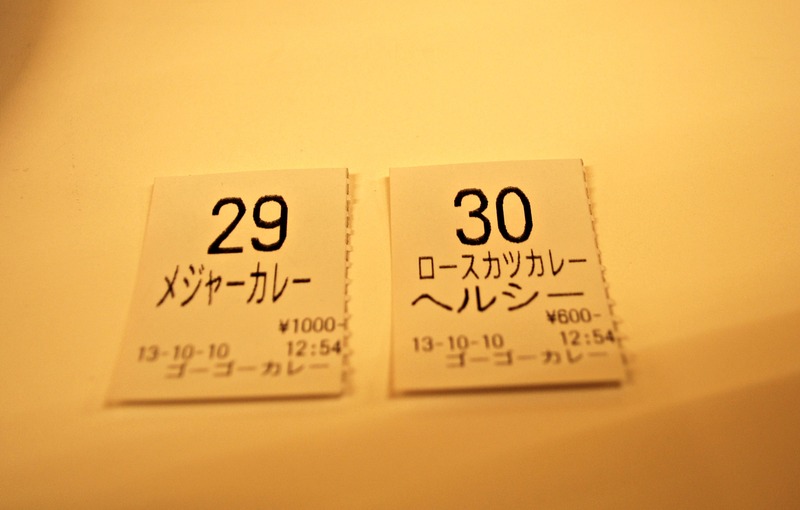 After obtaining our tickets from the machine, a worker came by, took them from us and rushed off to the kitchen. Because it was towards the end of the lunch hour there were only a few other people in the store, all salarymen. Within minutes our plates were brought out to us. When I saw mine I wondered if perhaps my eyes had been bigger than my stomach. It was huger than I remembered and when I picked it up it seemed to weigh a ton! M shook his head and said I would never be able to finish that thing. Determined to prove him wrong, I piled a bunch of bright red fukujinzuke on my dish and went to work. From the pictures, you can’t tell that there was rice on the dish but, trust me, it was there and plenty of it! 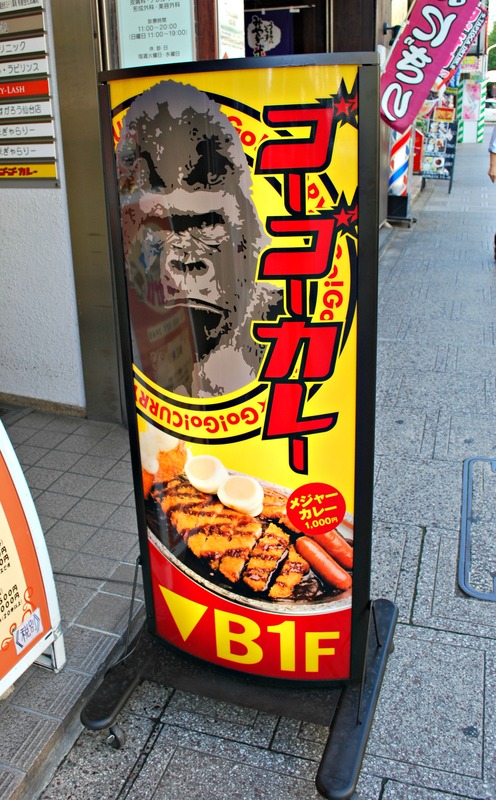 For the first few minutes, I was in deep-fried carnivore curry heaven, everything tasted so good! But, all too soon, I started to get full and I was dismayed to see that I hadn’t made much of a dent in my plate. Out of pity, M took the majority of my katsu, leaving me with a much more manageable amount of food. I polished off the remaining toppings and finished my lunch with only a bit of rice and cabbage left on my plate. Of course, I was stuffed to the gills and if I remember correctly all I was able to eat for dinner later that night was a small order of shoyu-butter fries at a beer hall. But it was worth the stomachache I was leaving the restaurant with, it was truly the best curry I ever had in my life! Object in picture is much larger than it appears. Japanese curries taste very different from Indians and South East Asian curries – milder in taste. I will try this chain when I’m in Japan next. The gorilla is so cute!! I’ve actually never tried Indian or SE Asian curry because I’m afraid it’ll be too spicy for me. Unfortunately, I’m a real lightweight when it comes to spicy things! Ah, no wonder M likes the Indian curries, he loves yoghurt! He’ll go to the Indian buffets all by himself for lunch sometimes. And now that I think about it, I did have Vietnamese curry one time and I thought it was pretty good. I know Thai curry is famous, I’ll have to give it a try sometime. And yes, if it’s too spicy for me, I’ll just pass it on to M, he loves the spicy stuff! It was yum, really the best curry I’ve ever had. Thanks so much for commenting! I know, right? Go! Go! Curry! has 4 stores in the U.S. but unfortunately they’re all in New York. I am crossing my fingers that they open up a branch in Los Angeles one of these days! I love katsu too, especially the chicken one! Sometimes the pork one is a little too dry for my tastes. Oh, I just copied what was on Go! Go! Curry!’s website, maybe their store list isn’t updated? It says there’s one at Ciputra Stadium Jakarta and another one at Citywalk Sudirman Stadium. I’m not sure if either of those are close to where you live but I’m so envious if they are. I’m still waiting for them to open up a branch in Los Angeles! Currently in Jakarta. Will try and let you know 😀 Thanks for this info! Thanks, I hope you can find the store there. I’m looking forward to more posts from you about all the yummy food in Jakarta! And if not in Jakarta you can try it when you’re back in Japan next year. I’m curious about the Go Curry that someone mentioned to me in a comment. Indonesian curry sounds really good too! I didn’t know there is one in Hong Kong!! I will definitely try this. Can’t wait!!! According to Go! Go! 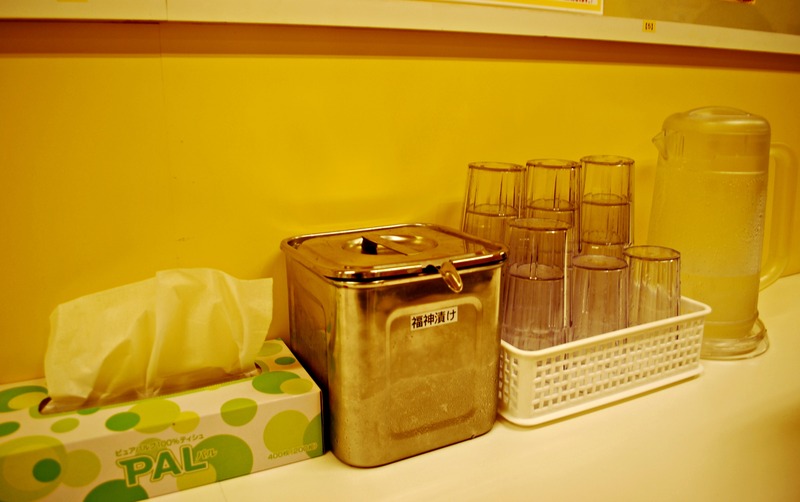 Curry!’s website, it’s located in Causeway Bay. Hopefully, that’s close to you. But even if it isn’t HK’s public transportation is so awesome and makes it so easy to get around everywhere. I wish we had something similar in So California. CURRY! The top picture is so amazing it jumped out at me when I opened the window haha. Such tasty-looking curry rice ( ´ ▽ ` )♡ I’ve never tried Go Go Curry, but this is just one more place I need to check out in the future; I love yummy and affordable food chains in Japan. 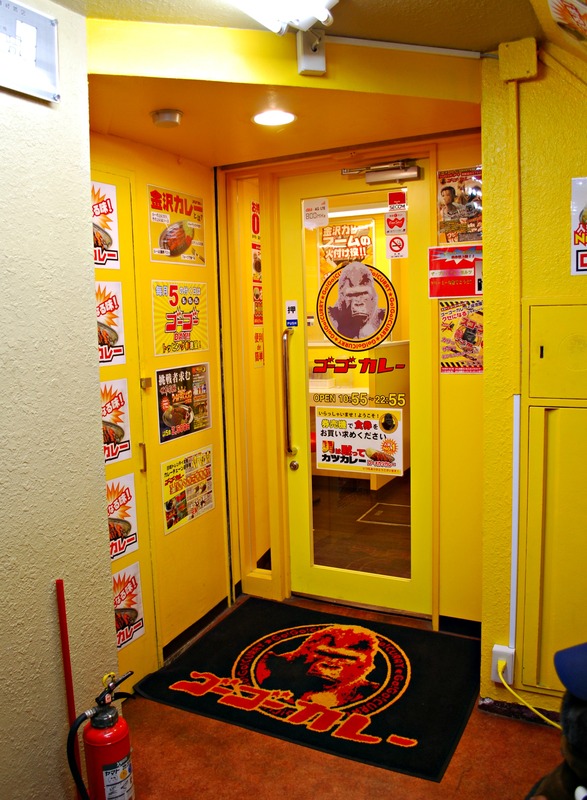 I’m actually kind of surprised that Go Go Curry hasn’t put a store in Singapore since it seems there’s a decent number of other Japanese chains there. 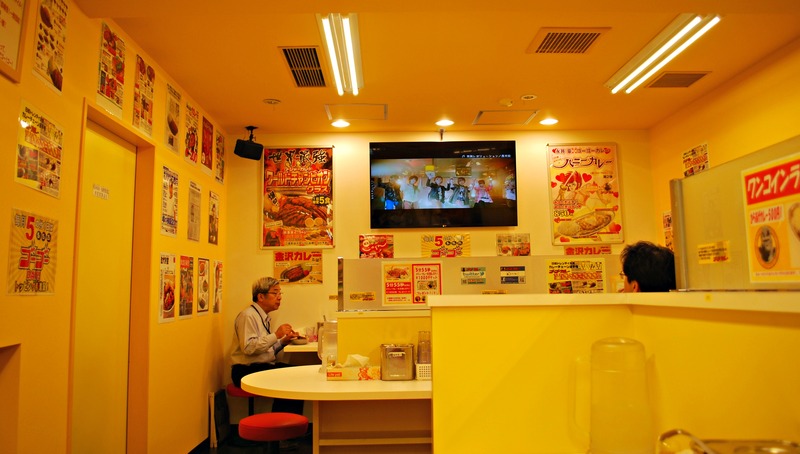 America, sadly enough, has hardly any of the popular Japanese chains. 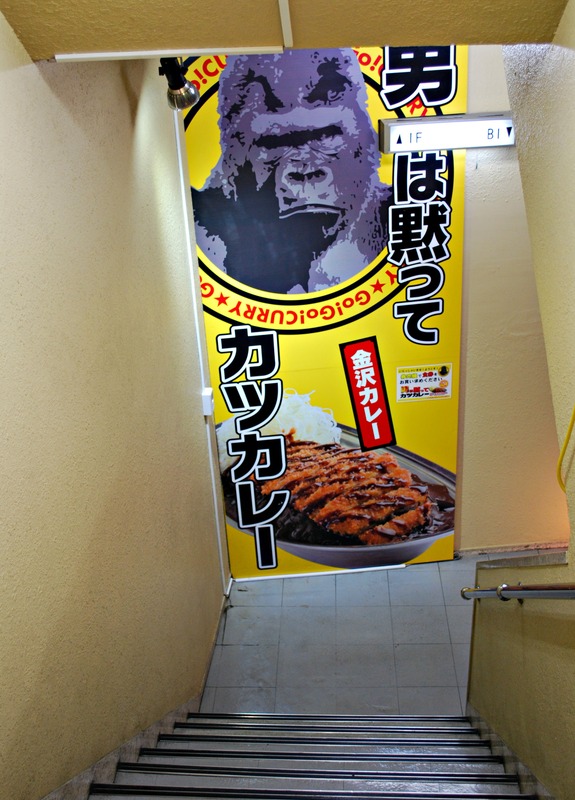 I think in this area it’s pretty much Yoshinoya and Coco Ichibanya! Oh no, what I missed! 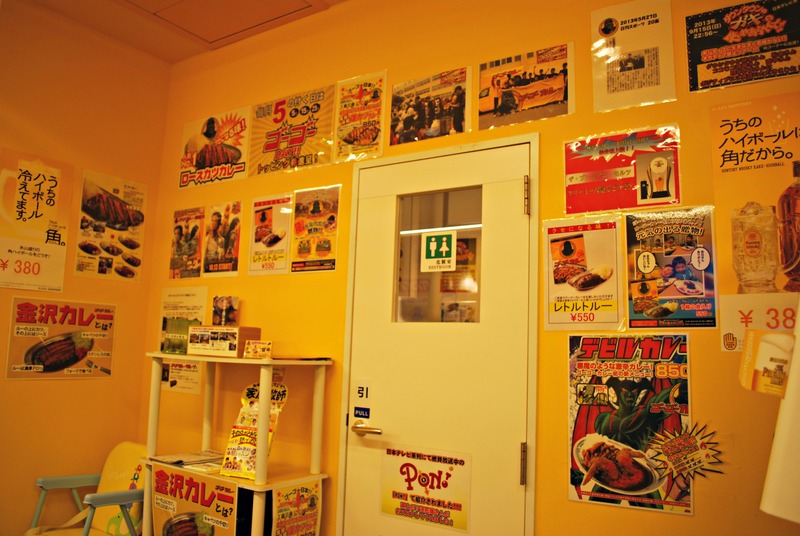 When I was in Tokyo last year I remember walking past a store of this chain and thinking “meh…I’ll pass” because their curry looked almost black in their pictures. Big mistake! ok, maybe next time. I’ll take a note. The curry sauce definitely is very dark at Go! Go! Curry! But for me, it actually worked in their favor because it reminded me of roast beef gravy which I love lol! I hope you’ll get a chance to try it on one of your future visits to Japan, I really recommend it! Looks amazing! Do you know if there’s a shop in Nagoya? I looked on their website and there doesn’t appear to be one in Nagoya. But I’m sure they’re constantly opening stores so there will probably be one in your area sooner or later. On a completely different note, I was looking through my Japan trip pictures the other day and realized that I had eaten miso katsu before. Not at a restaurant but as part of an ekiben, I thought it was delicious even though it was cold. I didn’t even realize it was a miso sauce on top. It so makes me want to try the real thing in Nagoya. That’s awesome! If you liked that then you would absolutely lurrrvvee the real stuff! Yes, one minute you’re happily tucking away food like there’s no tomorrow and in the next you’ve hit the dreaded wall and not another morsel can pass your lips. In America, I don’t really mind leaving food behind on my plate but I feel really guilty doing that in Japan. Both my mom and grandmother always told me it’s a mark of terrible, terrible manners so I try and force everything down. Oh how I miss Japanese foods! It has been 7 months! It’s only been a month for me and I already miss it so badly! Oddly enough, what I miss the most is plain white rice. For some reason, it tastes so much better in Japan. Yes. I miss Japanese Rice as well. Not to mention the sushi and tempura. I have always been curious about Japanese curry. My friend once cooked it for me. She bought the boxed curry blocks (I think it is called as Golden Curry, if my memory serves me well). With all due respect and love for me friend, it tasted… unexpectedly! Maybe it was me who was not used to Japanese curry. I am going to try it if I encounter “real” Japanese curry. Ah yes, Golden Curry, that is a very famous brand of boxed Japanese curry mix. To be honest, I don’t like it very much either, I would much rather go to a restaurant and eat curry even though it costs more. I’m guessing Indonesian curry must taste very different from the Japanese one. I hope to try Indonesian curry someday, it looks so delicious in pictures! Indonesian curry is not as spicy as Indian curry. Indonesian curry is very rich and aromatic. It is made with fresh herbs and spices. It also contains coconut milk, instead of cow’s milk or cream. I hope I can try some good Indonesian curry too. It seems like a lot of the restaurants that label themselves as Indonesian here in So Cal are actually more of a fusion with Chinese. I know they have to do that for business sakes since Americans are more familiar with Chinese cuisine. But it’s discouraging to know that you’re not eating the real thing. Hopefully I can take a side trip to Indonesia when I go to Japan one of these years. Besides curry I really want to try satay and the crispy roast pork. Maybe the restaurants are opened by people from Sumatra Island. In Sumatra Island, the five races has created a hybrid culture called as “Peranakan”. It affects our culture (especially our cooking styles) greatly. The five races are: Malay (Indonesian), Chinese, Tamil (Indian), Dutch and British (we do not have many “westerners” here nowadays). Maybe so. It’s so interesting to hear about all the different races that live side by side in Indonesia. I never realized that it was such a melting pot. Yes, the roast pork was at a place called Bima Kroda in Bali. Someone had written a post on it and it looked beyond delicious in pictures. Especially the cripsy pig skin! Indonesia is probably the richest country in the world when it comes to diversity. There are more than one hundred tribal language here (and that’s only the native ones). Wow, I’ve never eaten any animal’s lungs before. Or at least I don’t think I have. But I do like crispy foods, so I’m sure I’d enjoy it! I am learning a lot about Indonesia from you. I hope I’ll have the chance to visit there someday. And yes, I’ll definitely do my research. Planning for a trip is one of my favorite things to do lol! Is that a metallic plate? I don’t know why but I love eating food on a metallic plate. Is that Japanese mayo? I love Japanese mayo. It goes well with fried food! If it was the best curry you’ve had then I hope I can get a chance to try it! Seems like the restaurant doesn’t like the color yellow huh? hehehe. I loved being served on a metallic plate, I felt like a king lol! The white sauce on the fried shrimp was actually tartar sauce, but mayo would have been good too. I especially love Japanese mayo with fried chicken bites (chicken karaage). I always get that as an appetizer when I go to ramen shops. Go Go Curry has been expanding in recent months so hopefully they will open up a store in Manila one of these days. And yeah, it was like sitting in a yellow box while eating there! Did you order from a machine? Looks so hi tech! 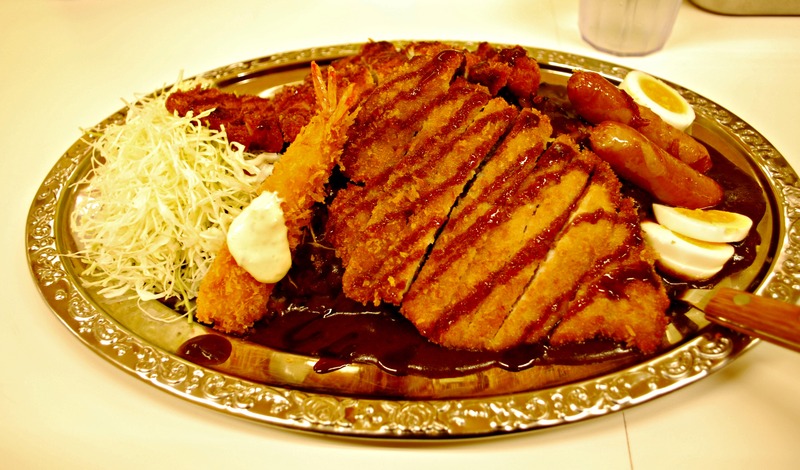 The curry katsu looks so good and crispy… unfortunately hard to find good ones any where around bay area. 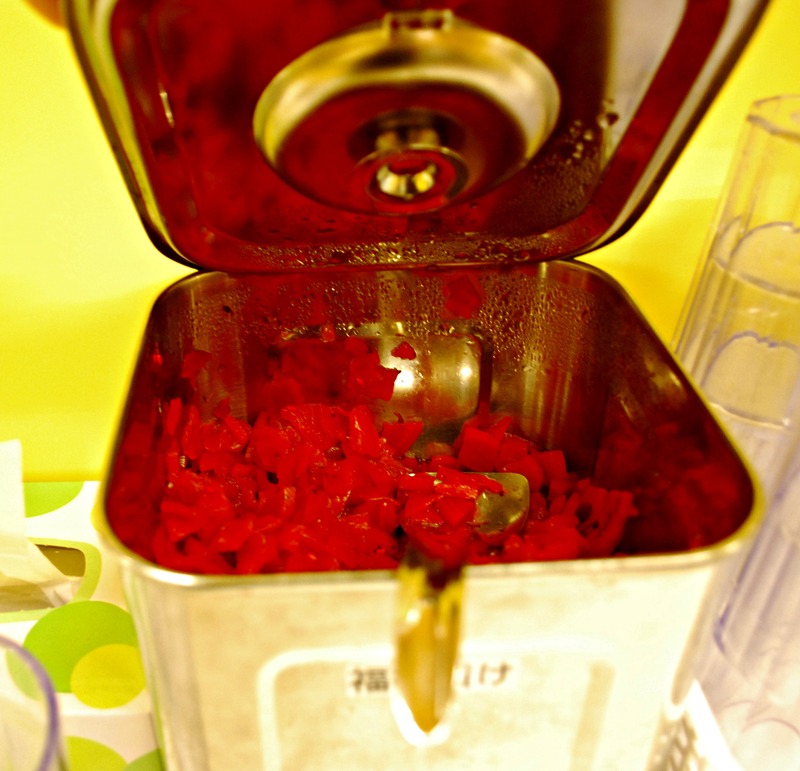 Yes, we ordered from the vending machine. I always like when the cheaper chain restaurants have it set up that way. Here in So Cal we have the Curry House and Coco Ichinbanya chains but they don’t compare to Go Go Curry. My brother moved to NY a couple of years ago so he gets his Go Go Curry fix all the time and loves to text me pictures of his dinners there, so mean lol! Actually so many people I know have never tried Japanese curry and their reasons are also tied to Indian Curry. It’s either because they 1) hate Indian curry so they don’t want to try any other kind of curry, 2) love Indian curry and have heard the Japanese one is not as good, or 3) have heard Indian curry is scary spicy and think Japanese curry will be the same. I have a confession to make as well: I’ve never tried Indian curry! I always keep meaning to but whenever I get the urge for curry I’m always off to one of the Japanese restaurant chains. Ack, that bit really hurts. This means I was just 5 minutes away from this curry wonderland back in April and never even knew it existed. I’m a huge fan of Japanese curry – so much so that even the cheapest, most basic konbini variety (plain curry sauce on rice with virtually no hint of meat or veg) tastes absolutely scrumptious to me. I’ll have to give them a try on my next visit. Incidentally, about the “World Champion Class”-sized rice portion on their vending machine menu. . . surely that monster’s meant for sharing?! Oh poor Diego! Don’t worry, you will get to eat delicious soup curry when you are in Sapporo in February. We had it at a place called Lavi Lavi (10th floor of the ESTA bldg, connected to Sapporo Station). We enjoyed it but there are so many other places to order it at. You can see a list here: http://www.best-of-sapporo-japan.com/japan-food-1.html. Even though we spent 3 days in Sapporo it was not enough and I didn’t get to eat at many of the restaurants on my list. I am sure that when you start posting the details of your trip I will be the one hurting lol! I know, the World Champion Class curry can’t possibly be consumed by one person, right? I did eye it when ordering but, of course, I was not seriously thinking of getting it. I really love Japanese curry. But to be honest, I have never tried any other kind so it’s hard for me to say that it’s my favorite type. I always keep meaning to try the Indian one but whenever I get the urge for curry I can’t stay away from the Japanese restaurant chains! Yes, I definitely need to expand on my curries. I’m probably going to be taking my best friend out for his birthday sometime this month and he mentioned he wants Thai food. So I’ll be trying my first Thai curry then. Not sure if it’s normally on the spicy side but I’ll make sure to ask if they can do it as mild as possible! 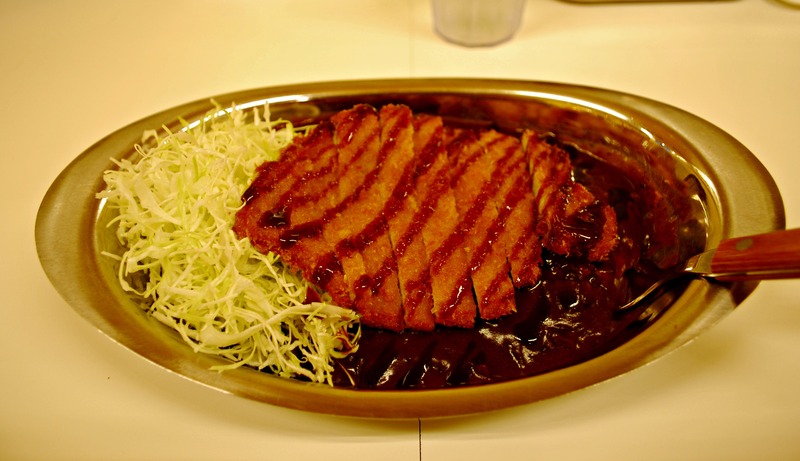 Halo Imjapan, i luv your Japanese curry photos, they are so delicious! Thanks so much for your comment! I love Japanese curry so much too. The one we had at Go Go Curry was one of the best I’ve had. The sauce was really good and all the different meat topping were WOW. I had never heard of “Battle Under Orion” before, I had to Google it. Looks very interesting, do they eat lots of curry in it?